We only use quality English Pool Table cloth. The Hainsworth Smart range Cloth is made in England using Australian Merino wool. 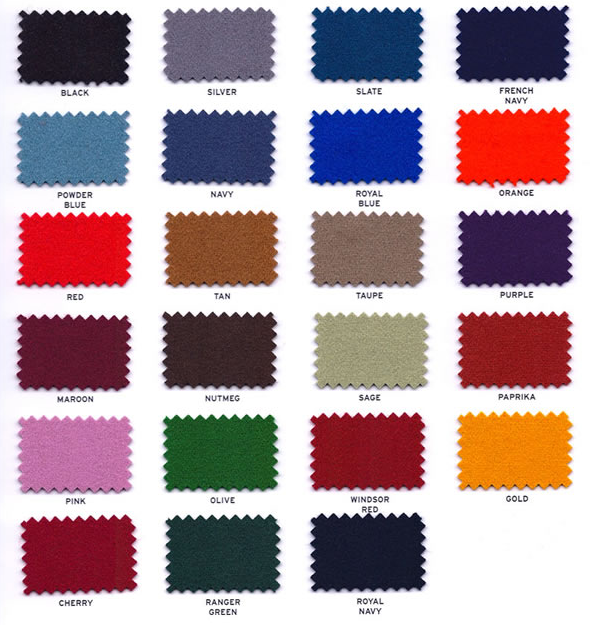 This is an extremely durable and hardwearing cloth and comes in a choice of 24 different colours. We do not use cheap CN imports. If you are shopping around, ask that question! There are a number of different sizes of Pool Tables. When talking about the size we are talking about the size of the slate. The measurement is taken from where the cloth meets the timber on top of the rail. The width of the slate is generally half the length. When changing the cloth on a Pool Table it is a good time to check the rubber, as it is very hard to change the rubber and reuse the same cloth that is already fitted. The rubber gives the ball its “bounce” off the cushion. Over time the rubber can harden especially if your table gets some sun. We can advise on the condition of the rubber when we take the rails off your table. We can also advise on the repair or replacement of the pockets on your Pool Table. From bag pockets to empire rails or just some new leathers or nets to spruce up the look of your table. Hainsworth Smart range, Made in England. This cloth has a smooth napped finish and offers excellent cue ball speed and ball control. If you are serious about your game and want a cloth that will deliver, then this truly is the cloth for you. We are also well experienced in Billiard Table refurbishments. Services include Recloth, Rerubber, New Pockets (Empire rails or bag pockets),”touching up” timber to a full respray of a table.Refurbishments to any type of Pool, Billiard or Snooker Table. Simply give us a call to discuss your needs and we can even arrange pick up and delivery.